During a lull at the recent ATF conference, I took the opportunity to remove the matrix I had electroformed from its rubber mould and pass it around. 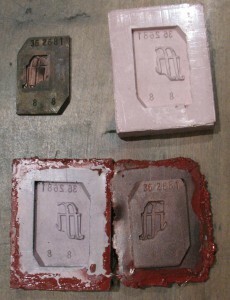 The original matrix, the defective rubber mould, and the new matrix still attached to its rubber mould. The matrix copy appears to have excellent detail. Unfortunately, the matrix copy is not flat. Its front surface is domed and when placed face-down it rocks back and forth. I had thought this might be caused by the force required to peel it off its mould, but a subsequent attempt to flatten it demonstrates that it is not flexible enough for that to have occurred. The matrix was well adhered to its mould, so it would appear that the rubber mould must have also been in a dished shape. I’m not sure what caused this. 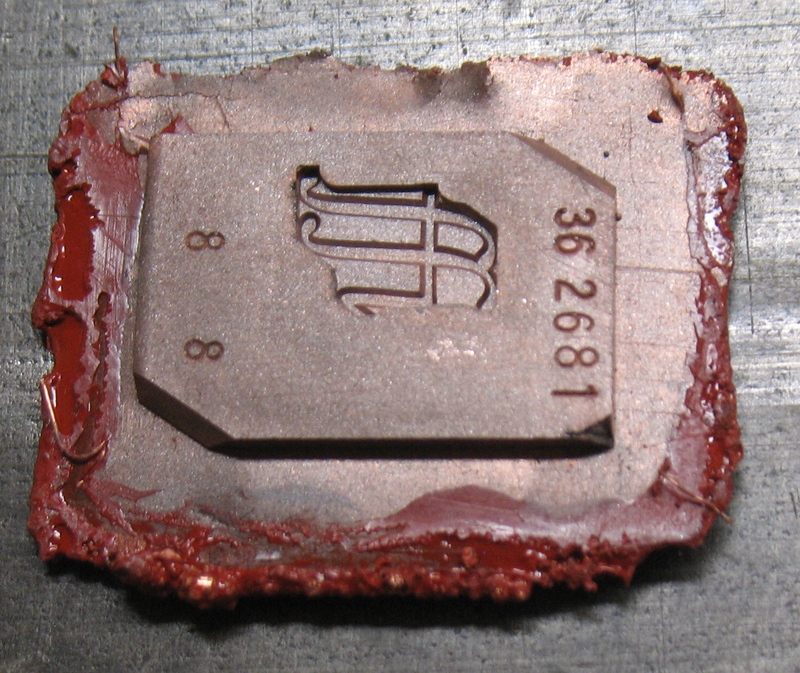 One possibility is that the rubber swelled a bit from water absorption on its back surface, while the front surface, sealed by the copper plating, retained its dimensions. 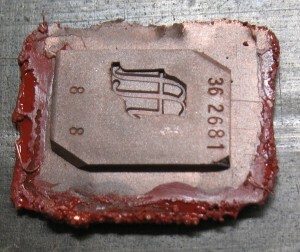 Another possibility is that the copper plated under tension, gradually warping the piece and pulling the rubber with it. The next task is to trim off most of the metal flash, and try to flatten the face of the mat using brute force. Once it is flattened I will fill the rear cavity (molten zinc has been suggested for this purpose) and finish machining the back.